Special forces units from across the globe descended on Tampa, Florida last Wednesday in a large-scale training exercise. The special forces units conducted a mock rescue mission on a large yacht docked near the Tampa Riverwalk. The event, a 30-minute drill exercise, was the featured spectacle of the Special Operations Forces Industry conference, which took place Monday through Wednesday of [last] week. Operations began quietly enough, with a team impersonating opposition forces raiding the Starship yacht at 1:30 pm. [When] the show went into full swing, dozens of special ops forces assaulted the ship via helicopter and speedboat — firing hundreds of blanks from their weapons all the while. The city’s Mayor Bob Buckhorn played the role of a captured hostage. During the demonstration, a range of special forces teams from several nations demonstrated their skills in front of thousands of onlookers. The troops fired thousands of blank rounds as they parachuted from aircraft, drove humvees and swooped down from several helicopters. 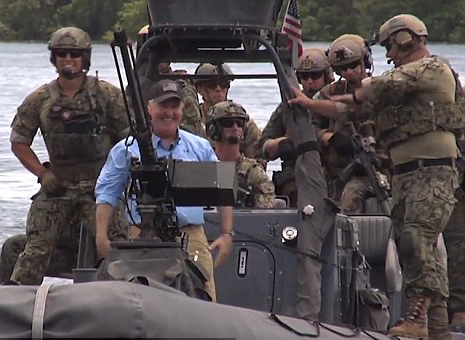 After the rescue team swept the ship and secured Buckhorn, they brought him aboard one of their rigid-hulled inflatable boats (RHIB). There, they allowed him to squeeze off a few rounds on a forward-mounted 50-caliber machine gun. The show of force is designed to highlight the military’s readiness in working together during a crisis situation. Joining US Special Operations forces in the exercise were Navy SEALS, Marine Raiders and Army Green Berets, plus highly trained military members from 15 other nations including Ireland and Jordan, many in make-up and disguises. “It is pretty amazing what we get to do out here, training with all these guys, all these different countries combating against the common enemy for all our countries. It is awesome being a part of it. I love it,” said a Special Forces member from the Navy who couldn’t use his name. Unusual for a military division that ordinarily operates under the dark of night to conduct covert operations, the exercise was performed before the public who watched from the sidelines. Rieka Stroh was there with her son and his two friends who were thrilled by the movie-like scenes played out in real life. “I think the more important lesson is that they see that our military is so capable and we are a significant force in the world,” Stroh told WFLA. Tampa Bay is home to the U.S. military’s Special Operations Command (SOCOM), the organization responsible for all U.S. special operations forces. Compiled from news reports at DailyCaller, WFLA .com, London’s Daily Mail and RT .com. PLEASE NOTE: This is the last Daily News Article of the school year. “Answers” emails have ended and will resume September 6. We hope you have an enjoyable summer! b) Where is SOCOM located? 2. What was the purpose of the training exercise held in downtown Tampa last week? 3. Which special ops forces participated in the training exercise held in downtown Tampa last week? 4. How many other countries’ special operations forces joined the U.S. at the training exercise in Tampa? 6. Read the “Background” and watch the video under “Resources” below. How does this report on the our military’s special ops forces inspire you? The United States Special Operations Command (USSOCOM or SOCOM) is the Unified Combatant Command charged with overseeing the various Special Operations Component Commands of theArmy, Marine Corps, Navy, and Air Force of the United States Armed Forces. The command is part of the Department of Defense and is the only Unified Combatant Command legislated into being by the U.S. Congress. USSOCOM is headquartered at MacDill Air Force Base in Tampa, Florida. The idea of a unified special operations command had its origins in the aftermath of Operation Eagle Claw, the disastrous attempted rescue of hostages at the American embassy in Iran in 1980. The ensuing investigation, chaired by Admiral James L. Holloway III, the retired Chief of Naval Operations, cited lack of command and control and inter-service coordination as significant factors in the failure of the mission. Since its activation on 16 April 1987, U.S. Special Operations Command has participated in many operations, from the 1989 invasion of Panama to the ongoing Global War on Terrorism. The annual Special Operations Forces Industry Conference took place at the Tampa Convention Center from May 24-26. Approximately 350 companies showcased their goods and services for commandos. The conference, says Dan O’Shea, a former Navy SEAL commander and counterinsurgency adviser, is the ideal place to get his company’s Human Terrain Analysis System in front of the operators who might one day rely on it to provide critical situational awareness. “Attendees at SOFIC include many special operators, a lot of SEALs, Green Berets, Army Rangers who understand the critical need to know the human domain where special operations forces are deployed around the world,” says O’Shea. The conference is put on by the National Defense Industry Association in conjunction with U.S. Special Operations Command. With headquarters at MacDill Air Force Base, the command trains and equips commandos, and spends several billion each year buying and sustaining special operations-specific goods and services. The biannual International Special Operations Forces conference is being held as well, bringing together special ops representatives from 80 nations. The separate conference, closed to the media except for keynote speeches, featured Lisa Monaco, assistant to President Barack Obama for Homeland Security and Counterterrorism, who spoke about U.S. efforts to counter violent extremists.